If pop media epitomizes our culture's status quo, then Superchic[k] strikes golden irony with an amped-up super-pop sound that exposes the world's inane measuring rods of air-brushed beauty, fabricated TV fantasies, and popularity politics. Superchic[k] - featuring Max, lead singer Tricia, her sister and guitarist/vocalist Melissa, six-stringer Justin, drummer Brian, and bass player Matt (who once decapitated the group's van via a hotel overhang) - fires out a melody mosh pit with sardonic wit that propels the computer nerd and band geek straight to prom night royalty. Flipping back a few calendars, Superchic[k] first started as a mere concept. While touring with another group, Max met a girl who rebelled against her school's petty political flow and yet still became Homecoming Queen by the average students' will. From this inspiration, Max formed Superchic[k] with the empowering message that kids will live grander lives if they seek God's will and follow their dreams outside the cruel "codes of cool." Moreover, the group wanted to show people what can be achieved simply by trying, which is why the band opts to produce and record their albums in Max's deep, dark basement. Max remarks, "We hope to be the start of truckloads of bands making their own albums and finding millions of fans through the internet." In 1999, Superchic[k] made its live debut before 5,000 kids at an Audio Adrenaline show and then before thousands more at the Wisconsin music festival Lifefest. The following year, the group self-released an eight-song album and began touring the country with Teen Mania's Acquire the Fire youth events. With industry buzz overwhelming, Superchic[k] soon signed to Inpop Records and morphed their eight-song self-release into Karaoke Superstar. Following their Inpop debut, their CD garnered fan approval at retail, and rave reviews and press from the Chicago Tribune, New York Times/Scholastic magazine, Dallas Morning News, Billboard, R&R, CNN, Newsweek, Mary Kate & Ashley magazine, and many others. The April 2002 issue of Campus Life also proclaimed Superchic[k] Best New Artist of the Year. They also spent 2000-2001 touring incessantly with such high profile outings as Festival Con Dios with Audio Adrenaline, Newsboys, and the O.C. Supertones. 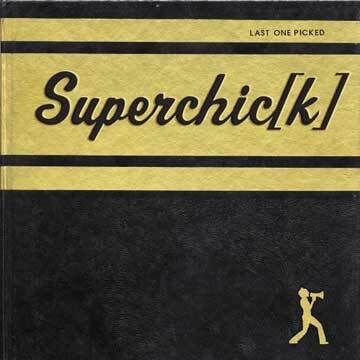 Superchic[k]'s 2001 label debut, Karaoke Superstar, amassed piles of critical praise, topped R&R's Christian rock chart. "Barlow Girls", was nominated for two Dove awards for Rock Album and Rock Song of the Year, and landed nearly forty major TV/film placements, from Alias and The Practice to MTVís The Real World and the feature film The Glass House. The group's upbeat anthem "One Girl Revolution" even scored the soundtrack and main credits sequence for Reese Witherspoon's 2001 hit Legally Blonde. Without question, this inspired Midwestern pop group has penetrated the mainstream with a hope-filled, spiritually-centered message that's already been heard by tens of millions of people. And though the group clocked in over a 100,000 miles in their 15 passenger van this past year, Superchic[k] is already dropping an astonishing new album, the poignantly titled Last One Picked. 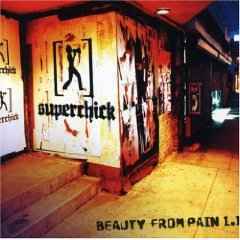 The energetic, pop-punk band Superchic[k] continues its genre-busting journey with "Beauty from Pain". The album exhibits Superchic[k]'s unique, new wave/rock sound coupled with positive, uplifting lyrics covering topics both serious and witty. If Karaoke Superstar fashioned a home run sound, then Last One Picked hammers a grand slam right out of the ballpark. 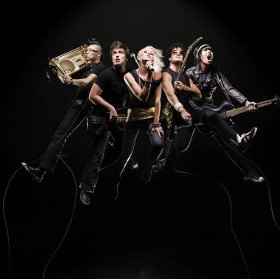 Max, the group's creative mad scientist, produced the new album in a way that accentuates their diverse stylistic twists while shooting the sonic levels right off the charts. Likewise, the new songs offer more pointed commentary about the world's social snares while encouraging fans to seek and follow God's individual purpose for their lives. "Karaoke Superstar told us that we don't have to compare ourselves to what's on television," says Max, "but now it's a matter of making that life knowledge stick as we continue getting ridiculed walking down our school halls. This new album is about that type of courage." "We want kids off their couches and figuring out how they're special," says Max, "even if that means people will laugh at your failures. 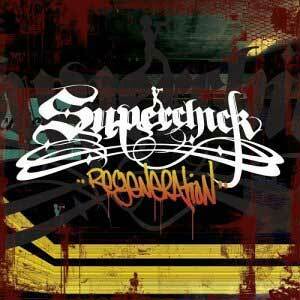 Superchic[k] is just a bunch of kids from the Midwest making albums in my basement and look what happened. We aren't just telling kids what to do, we are out there doing it ourselves." "At some point, everyone knows what it's like to be the last one picked," says Tricia about the album title. "The new album addresses some heavy subjects, like a girl we met who won't eat lunch because her jeans don't fit anymore. She's worried because the world says she's not thin enough when the only person she really needs to please is God." "We believe that God has a plan and purpose for everyone's life," adds Melissa. "Some days you might feel like a one girl revolution, but that shouldn't keep you from believing that God is in control. On tour we talked with so many kids facing so many hard times, and a lot of what we heard inspired us in writing the new album. We encouraged them to cling to their faith because the next day can be better." Last One Picked invigorates with energized emotional anthems like "So Bright (Stand Up)", a guitar-driven call to remain surefooted against life's wicked winds, and "Hero", a life-giving lesson about how even small acts can reap huge rewards in a wounded person's life. The poetically-transparent "One and Lonely" - inspired by the inner-struggles of a girl the band met on tour - tackles the shaky insecurities in facing one's self-identity, while "Real" was written in direct response to a 12-year-old girl's letter describing the bitter pill of being young and unpopular. On the other end of the spectrum, the punk-inspired "High School" delivers biting narrative about adults who still think life is one big popularity contest. Through all their musical growth, the group best spreads their artistic wings with the pain-drenched piano-ballad "We All Fall" that drips with empathy and compassion. Overall, Last One Picked champions not the victors, but those who seek and follow God's purpose, reminding us that success is a journey and not a destination. Melissa states, "I think our message is best summed up in Jeremiah 29:11, which says, 'I know the plans I have for you, declares the Lord, plans to prosper you, not to harm you, plans to give you hope and a future.' I want to tell kids that I am just an ordinary person, but by following God's purpose for my life, He's brought me to do some amazing things." Until a few years ago in Christian music, an act was introduced to the public as the religious version of a named mainstream performer. That way, the reasoning went, audiences could identify with the music they were picking up off the shelves. With hit songs "Barlow Girl" and "One Girl Revolution", Superchic[k] is a rocking group of Christians whose music emanates their love for Jesus. They are strong proponets of morality and Christ-like relationships, and are a shining example of the way Christians should act on a day to day basis. Superchic[k]'s "Pure", completes their trifecta of love inspired songs. 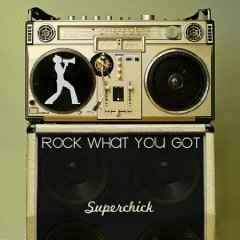 Listen for Pure on Crossrock, and be sure to request your favorite Superchic[k] songs all this month. You can pick up a copy of their new album: Beauty From Pain.